Beet: A biennial Eurasian plant of the goosefoot family, usually having a swollen edible root. Beets (Beta vulgaris) are descendants of the wild sea beet of European coastal regions of the Mediterranean Sea and the Atlantic Ocean. Both Greeks and Romans cultivated beets. Originally cultivated for the leaves and later for the roots, it is uncertain exactly when they were first domesticated and when they began to be bred for their swollen roots. An old Harper's Bazaar article says that beets are good for removing wrinkles and bags under the eyes. The Sugar Beet was designated as the Official Historic Vegetable of Utah in 2002. · Yellow beets (manglewurzel) are grown for livestock feed. Today there are 4 distinct forms of cultivated beets, each one grown for a different purpose. 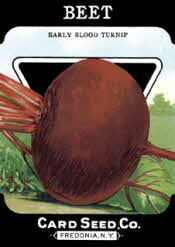 1) The beetroot or garden beet is grown for its edible root. 2) The leaf beet or Swiss Chard, grown for its edible leaves. 3) The sugar beet grown for its high (20%) sugar content and a major source of sugar. 4) The mangel-wurzel grown for livestock feed.